The unifying theme of this wonderful French contemporary home is the melding of architecture to the breathtaking views of the San Francisco Bay. Enjoy the ever-changing panorama of light and color, sea and sky through the expansive picture windows and step out to the exquisite deck with glass surround to almost touch the Palace of Fine Arts. The major remodel of the house has been thoughtfully designed and executed for elegant entertaining and quiet enjoyment. High ceilings, skylights and tall doors contribute to the sense of light, air and space throughout. The state of the art systems provide for ease of maintenance and security. The beautiful art glass of the front door in the Deco style welcomes the guests. The design echoes the Deco pattern in the brick work of the driveway. The entry floor is laid in large French limestone squares on the diagonal and the stair treads are of California Madrone hardwood, which is continued on the entire main level. The main floor contains two magnificent GREAT ROOMS that are designed for flexibility according to the owner’s desire to entertain formally or informally, but elegantly. 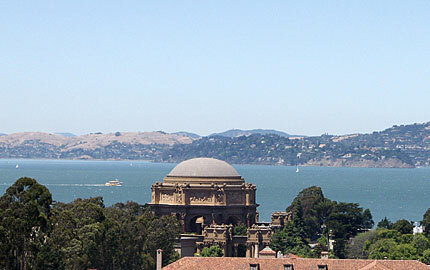 The GALLERY leads to the heart of the house, the VIEW FAMILY/MEDIA ROOM, which features an enormous expanse of glass with an impressive outlook to the Bay, Golden Gate Bridge, Palace of Fine Arts and Alcatraz Island. The ample space provides for comfortable lounging and informal dining around the massive stone fireplace. A custom built media center conceals a large flat screen television and stereo equipment with surround sound. 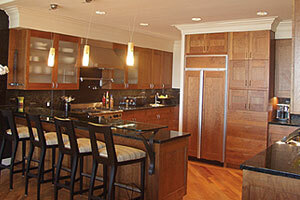 Hosts and guests can socialize in the open KITCHEN which features a long counter with bar seating. It is fully equipped with state of the art appliances for the serious gourmet cook. The ample counter tops are made of granite, the beautiful cabinets of cherry wood with sand blasted glass fronts and custom lighting. The second GREAT ROOM at the front of the house is presently used as a formal DINING ROOM but may serve as a formal LIVING ROOM if the owner desires. 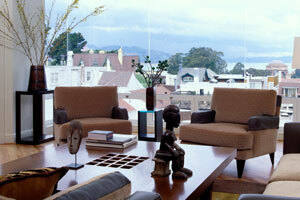 It features a tall and graceful curved bay window with beveled glass panes overlooking the tree lined street. The east wall contains a massive granite fireplace and fine cabinetry crafted in the Biedemeier style; custom lighting enhances the display of objects d’arts. A GUEST CLOSET and GUEST BATH (with mosaic glass tile work, marble pedestal sink and ostrich skin wall covering) complete this floor. Ascend the gracious staircase with Deco hand-wrought railing in matte bronze and iron finish. Natural light floods the landing from the large skylight onto the tall custom display for lighted objects d’arts. The spacious and stunning MASTER SUITE features an expansive DECK with all glass surround, providing a memorable view of the bay and its famous landmarks. Grass cloth wallcovering and carpeting in soft uniform colors and pattern set the elegant tone. 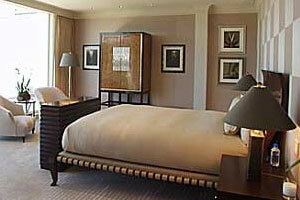 A fully equipped built-in desk for two provide all the conveniences of the ideal master suite. The luxurious MASTER BATH includes: an all marble surround with vanity and double designer sinks, Whirlpool spa, glass steam shower and convenient bar refrigerator. Enter through the tall sand blasted glass doors to the oversized, truly custom WALK-IN CLOSET which houses extensive his and her wardrobes. Dumbwaiter access for luggage. Two additional BEDROOMS look over the sunny tree-lined street, and each has an adjoining tastefully tiled BATH with tub and designer sink. A convenient LAUNDRY/CLOSET housing a stacked washer/dryer completes this floor. Multi-use SITTING ROOM & BEDROOM with view and tiled FULL BATH for use as a home office and exercise room, or quarters for family or staff. Convenient, fully-equipped CATERING KITCHEN and temperature controlled WINE ROOM, LAUNDRY (with stacked washer/dryer), ample custom storage cabinets, secure package delivery closet and two-car tandem GARAGE.